Zorina, A. A., Novikova, G. V. and Los, D. A. (2015). Substrate Specificity of Recombinant Ser/Thr Protein Kinase. Bio-protocol 5(6): e1426. DOI: 10.21769/BioProtoc.1426. Protein kinases are enzymes that phosphorylate proteins in a cell. Determination of kinase activity in reactions of phosphorylation is a very convenient way for a biochemical characterization of this group of enzymes. Here we describe a method to determine the activity of a recombinant Ser/Thr protein kinase using as a possible substrate MBP, H1, and BSA. Amplify a DNA fragment carrying the gene of interest using synthetic primers. For the more convenient cloning of the desired insert, it is worth to construct the primers harboring specific restriction sites for endonucleases. The easiest way to clone this PCR product is to use T-vector pTZ57R/T. Transform DH5-α strain. Spread transformed cell onto LB agar plates containing ampicillin, IPTG, X-GAL. Incubate overnight at 37 °C. Select white colonies that should harbor plasmid with a desired insert and inoculate 3 ml of LB-medium. Extract pDNA from the overnight culture. Check it for containing your full length insert either via PCR or via restriction analysis. Ligate your restriction fragment with the appropriate expression vector. Transform E. coli expression strain with the resultant plasmid using CaCl2 method (Sambrook et al., 1989). Spread transformed cells on the LB-plate containing specific antibiotic that is coded by the expression plasmid. Manipulations with bacterial cells should be carried out in a flow box (He, 2011). Grow the transformed cells in 100 ml of LB-medium until the OD595 of suspension reached 0.5. Initiate overproduction of the recombinant protein by the addition of IPTG to a final concentration of 0.1 mM. Induction conditions may vary strongly (from 3 h at 37 °C to 15 h at 25 °C). Centrifuge cells at 3,500 x g for 10 min at 4 °C. Resuspend the collected cells in a prechilled homogenization buffer (1 g of cells in up to 5 ml of buffer). Disrupt the cells either using a French Pressure Cell Press (2.8 MPa) or glass beads (use an equal volume of beads and cell suspension. Vortex vigorously for 30 sec. To avoid warming of the sample incubate a test tube for 30 sec on ice. Repeat this procedure 10 times). All procedures should be carried out at 4 °C. Centrifuge the crude extracts stepwise, first at 7,500 x g for 15 min to remove unbroken cells and afterwards at 16,000 x g for 20 min for clarifying cell lysate. Procedures should be carried out at 4 °C. Collect supernatant (soluble protein fraction) and keep a pellet. Desalt the soluble protein fraction on NAP-5 columns according manufacturer’s instruction. Elute the protein with 20 mM MES-КОН (pH 6.5) and determine protein concentration using BCA Protein Assay Kit. To determination protein quantity in the pellet resuspend it with 4% of SDS and recover the proteins by centrifugation at 16,000 x g for 20 min. Then determine protein concentration with BCA Protein Assay Kit. Mix protein sample with appropriate amount of Laemmli sample buffer to get the final protein concentration 1 mg/ml (He, 2011). Prepare and run SDS-PAGE. Stain the gel with CBB R250 (Yan, 2011). Analyze both the desalted soluble fraction and proteins from the pellet using SDS-PAGE. If your protein is soluble proceed to the protein kinase assay. If the protein is in the pellet, it is necessary to recover the protein from inclusion bodies or to start over induction procedure in other conditions, trying to shift the protein into the supernatant. Alternatively, purify the soluble proteins further by affinity chromatography. The first possibility allows to obtain the result much quickly. The second one requires more time and an additional purification step but gives the better picture with the fewer non specific bands. where N - number of days passed from the day of calibration, taken from the passport of the product. 14.3 days - half-life period of the 32P. The reaction is initiated by the addition of 5-100 µg of the recombinant protein kinase and allowed to proceed for 15 min at 30 °C. The quantity of the recombinant protein kinase in this reaction depends on whether affinity purified or non-purified the recombinant protein kinase is used. The reaction is terminated by adding half of the reaction volume of 3x Laemmli sample buffer and samples are boiled for 5 min. Phosphorylated products are resolved on SDS-polyacrylamide gels. The gels are then stained with CBB R250 as mentioned above, dried, and subjected to autoradiography. Exposition of dried gels with the X-Ray film varies from few hours at room temperature to few days at -70 °C and depends on the quantity and the activity of the recombinant protein kinase. If the recombinant protein kinase is enzymatically active it can demonstrate either autophoshorylation or phosphorylation of the substrate exogenously provided. So, it is possible to make a decision about substrate specificity of the recombinant protein kinase examined. According to the results obtained we can conclude that at the phosphorylation condition described here the examined recombinant protein kinase is capable to phosphorylate histone H1. 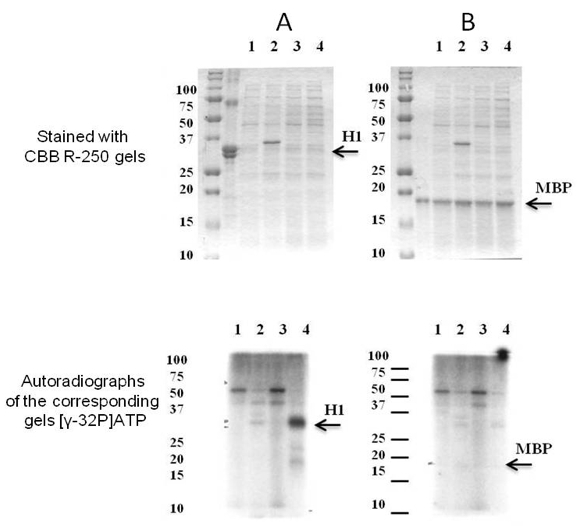 Since at the autoradioradiograph there is no a signal corresponding to apparent molecular weight of the recombinant protein kinase it does not undergo autophosphorylation. This work was supported by the grant from Russian Science Foundation no. 14-24-00020. He, F. (2011). Standard DNA cloning. Bio-protocol Bio101: e52. Sambrook, J., Fritsch, E. F. and Maniatis, T. (1989). Molecular cloning: a laboratory manual. Cold Spring Harbor Laboratory Press. Yan, Q. (2011). Rapid coomassie protein SDS-gel staining. Bio-protocol Bio101: e83. Zorina, A. A., Bedbenov, V. S., Novikova, G. V., Panichkin, V. B. and Los, D. A. (2014) Involvement of serine/threonine protein kinases in the cold stress response in the cyanobacterium Synechocystis sp. PCC 6803: Functional characterization of SpkE protein kinase. 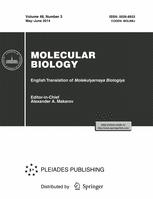 Mol Biol (Moscow) 48: 390–398. Zorina, A., Stepanchenko, N., Novikova, G. V., Sinetova, M., Panichkin, V. B., Moshkov, I. E., Zinchenko, V. V., Shestakov, S. V., Suzuki, I., Murata, N. and Los, D. A. (2011). Eukaryotic-like Ser/Thr protein kinases SpkC/F/K are involved in phosphorylation of GroES in the Cyanobacterium synechocystis. DNA Res 18(3): 137-151. How to cite: Zorina, A. A., Novikova, G. V. and Los, D. A. (2015). Substrate Specificity of Recombinant Ser/Thr Protein Kinase. Bio-protocol 5(6): e1426. DOI: 10.21769/BioProtoc.1426.